It wouldn’t be right to start this blog entry without a reference to Part 1 of Word Smoothie’s’ journey :…Part 1- Bedrock, or where it all begins , in which I expound the importance of languages (particularly Latin, yes I know), spelling, grammar and communication skills in general. Perhaps it doesn’t take a genius to work out that something has gone horribly, horribly wrong in this world when some degree courses now find it necessary to offer modules on ‘Communication’, and ‘Skills for the Workplace’ in response to a rising number of prospective employers, bemoaning the trend towards interviewing new Graduates who possess the most amazing array of qualifications, but who are unable to string a sentence together, or write a document without heavy use of spellchecker. (Ok, so let’s be clear here, I have a daughter on the dyslexic scale and realise that not everyone is equally able in this department. I promise I’m not a spelling snob, but merely refer to the general lack of importance placed in this area). I blame the digital revolution. Texting specifically. We have become used to reading (and also writing), at great haste and speed, a missive in ‘txt spk, thx, K’. Even us oldies. Trust me, it takes some practice and I don’t think I’ll ever be fully up to speed with texting shortcuts – actually I’m not sure I really want to be either. Perhaps I’m the only person on the planet who finds it impossible to write a text message without appropriate use of apostrophes, commas and capitals. Anyone else with me on this? Just doesn’t feel right to leave a sentence hanging there without a proper ending. I have a lot to thank my Dad for on this one. He was a stalwart for correct spelling and pronunciation. As a child, he would never let me get away with saying ‘yeah’ for example. I would always receive a stern look and a corrective action – ‘It’s yeS‘ not ‘yeah, young lady’. YES Dad. And how right he was. Now, I’m not suggesting by any means that we all go back to Victorian times and enforced elocution lessons. After all, language is an ever-evolving, living, changing thing. I embrace the many and varied languages, dialects, accents and ways in which we communicate as a species wholeheartedly. 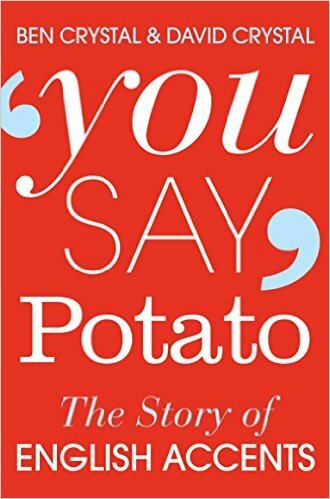 One of my favourite recent reads is a book by Ben and David Crystal called ‘You say Potato, the story of English Accents’ . Right up my Cul -de -Sac this one. I read it avidly from cover to cover and bored my friends and family with gems of information and insight from this too. Dad was also brilliant at sneakily enhancing my vocabulary as a child by using words he knew for sure I didn’t understand, thereby relying on my natural curiosity to evoke a question about the meaning of said new word. It could also have gone horribly wrong of course, but he knew full well I wouldn’t be able to resist asking. I say he was sneaky, actually I think he was a genius teacher. I grew up with a love of languages all around me, and learned to speak German as a child with the help of my similarly-aged nieces who lived there (along with older sister), and regular visits back and forth over the childhood years. I make no bones about being a natural talent at French, and at Latin, and I still feel the draw of learning a foreign language every time I visit somewhere new. I reckon there’s no better way to really get under the skin of a c0untry’s culture and people than by being able to communicate in the local language. It’s a matter of pride for me that at one point in my life (probably whilst living in Munich as part of my degree course) I was barely identifiable as a native English speaker. Most people assumed I was German, I suppose the ultimate compliment to someone hoping to be fluent in a foreign language, if that’s what floats your boat. And it does mine. Perhaps to go back to the title of this blog, the keyword here is communicate. We just don’t seem to be doing enough of it despite the explosion of social media in recent years where everyone seems to have an awful lot to say for themselves, all of the time. Who can believe it has been 26 years since BT (and Bob Hoskins) told us ‘It’s good to talk’ . And I can only agree.